Dear Family: A doll friend told me about a contest in a doll magazine. She encouraged me to enter with my story about my Ideal Toni doll, the doll you give home perms to. My Toni doll was my favorite as a child and a Christmas present from Santa Mom in 1949. The rules: 200 words or less about the doll accompanied with a picture of the doll. The entries are to be judged on originality and appeal of the story, condition of the doll and originality of pose in photo. Three winners will be chosen and each will receive a new Toni doll courtesy of The Effanbee Doll Co. The winners will be featured in the Sept. 2007 issue of "Contemporary Doll Collector" magazine. Here is my entry. Attached is the copy of the photo submitted with my entry. I won Second Prize! With the parish blossoming with young post war families, a parochial school went from drawing board to reality. I was there at the ground breaking in 1947, graduating in 1955. Our new school library was book less, so an auction was held to raise funds. A ferocious reader, I was eleven and thought it would be great to donate my beautiful blond Toni in her blue Heidi type dress along with my other dolls, cradle, buggy and doll house for the cause. Decades passed, I had raised my three sons on my own and now yearned for the wonder years of childhood. With visions of my Toni doll, the hunt started. Finally, a Toni with the right blond shade made her way to my home. Beneath the fog of dirt emerged a gorgeous shiny blue eyed blushed Toni. Now she needed her blue Heidi dress and another year of searching ensued. 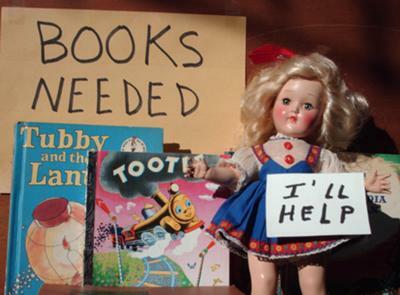 One day a friend called saying she was having a yard sale to benefit a poor Indian Mission School's book supply. Entering the yard, I spied a poor Toni wearing the blue Heidi dress. Forty dollars towards the books and the dress was mine. Books to books, Toni was home! Jo, I know there is at least 50 styles plus variations of plaids used, different colors used on a lot of the styles etc. Sorry, I don't have your email to send pictures. Lucky you to win a new Toni! I am a book lover too. I really enjoyed your Toni story, sounds like a miracle! I would love to see pictures of your Toni dolls & Toni dresses! I have 2 toni's that have Toni dresses...and one Toni dress without Jacket! How many dresses do you think were made for Toni? I'd love to have more dresses. Hope to hear more about your Toni's soon. Jo in Houston..
Join in and write your own page! It's easy to do. How? Simply click here to return to Ideal Toni Dolls.